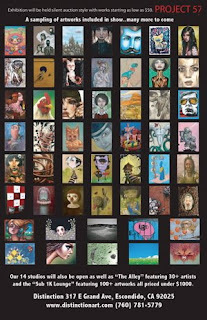 If you are nearby the area of Escondido, CA stop into Distinction Gallery and see an awesome show, Project 57! $10 admission, silent auction style, proceeds of the auctions go to The Lewy Body Dementia Association. Exhibit with 100+ artists (myself and friend Alex Willan included). I have made it home from the Seattle, SDCC and my L.A. side trip. Earthquake and all. Getting home I sadly realize I did not take many photos while in San Diego. However, It was another successful venture to the Con. As always it is great to see the people I hardly ever get to see. It is also nice to meet a slew of new people. Now I have a lot of work ahead of me. A couple shows to prepare for and who knows what else. Mmmmmm...Roscoe's chicken and waffles are really the best thing since sliced bread. 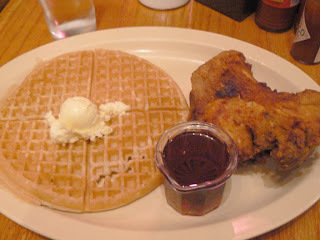 Just had Roscoe's last week- for the first time, actually, after a lifetime of living in LA. Delicious. 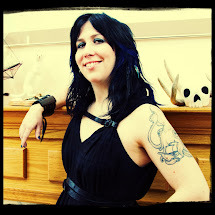 Also- your work is amazing! Your plush octopi astound me to no end. I have obtained an unhealthy obsession with Chicken and waffles since this adventure. The are quite delicious!